thy spouse: i.e., the church. goes richly painted: i.e. appears wearing a great deal of makeup. robbed and tore: This may be an allusion to protestant iconoclasm. peeps up: pops up; suddenly appears. 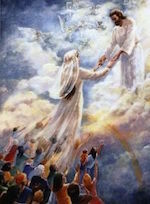 thy spouse: The idea that the church is the "Bride of Christ" is suggested in quite a few Bible verses; see the Wikipedia entry on this topic. 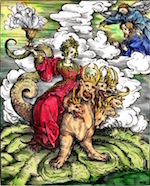 goes richly painted: "Paint" was associated with prostitutes, and this passage may allude to the idea, promoted by both Luther and Calvin, that the Catholic Church is the "Whore of Babylon" described in the Book of Revelation.